Daylight savings ends tonight for most of the country that is affected by it. That will bring earlier nighttime skies meaning most pilots will be flying more night hours. The Aircraft Owners and Pilots Association Website has a good night flying review called, "Safety Hot Spot: Night VFR Checkup." Check it out. All of my flying experience has taken place during daylight savings. During daylight savings, in Eastern timezone pilots in the eastern timezone you simply add four hours to military time (24 hour clock) to get Zulu time, the Universal Coordinated Time used for aviation. With the return to standard time pilots in the Eastern timezone should now add 5 hours to the current military time. 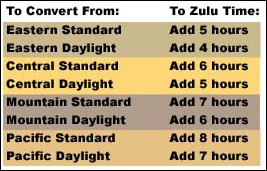 The most recent ePilot Newsletter from AOPA provided the chart above for converting your local time to Zulu time. They also wrote "To convert Zulu to local time, if the United States is on standard time, subtract five hours from Zulu to get Eastern Time, six hours for Central, seven hours for Mountain, and eight hours for Pacific Time. If the country is on daylight-saving time, subtract one hour less for each time zone."